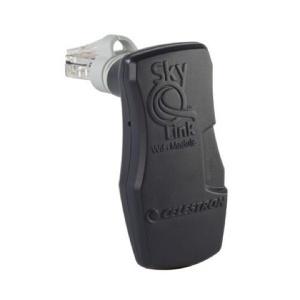 Celestron's updated SkyQ Link 2 WiFi Module turns your smartphone or tablet into your own personal planetarium and observatory! As SkyQ Link 2 slews your telescope to an object, you can listen to hundreds of included audio descriptions on your device, which explain the history, mythology, and key features of the most popular celestial objects. Activate the Sky Tour feature and SkyQ will display a list of the best objects to view based on your exact time and location. There’s no need to input GPS coordinates or set the time and date—SkyQ Link 2 takes this information directly from your device. SkyQ Link 2 makes a great gift for telescope users of all ages and skill levels, from kids to advanced users. Take your family on a guided tour of the universe with SkyQ Link 2! Celestron’s latest version of the SkyQ Link WiFi Module works with our brand new planetarium app, SkyPortal. Available free on the Apple App Store and Google Play, SkyPortal is your key to the universe—with or without SkyQ Link 2.